AMY GOODMAN: Let’s start with Pakistan. Explain what these unmanned drones are. P.W. SINGER: Well, you’re talking about systems that can be flown remotely. So, the planes, these Predator drones, are taking off from places in, for example, Afghanistan, but the pilots are physically sitting in bases in Nevada. And there, you have incredible capabilities. They can see from a great distance. They can stay in the air for twenty-four hours. And so, they’re very valuable in going after these insurgent and terrorist hide sites, which is in, you know, mountainous terrain, and it would be difficult to get US troops in. But the flipside is that there’s a question of what’s the message that we think we are sending with these systems versus the message that’s being received on the ground, in terms of the broader war of ideas. P.W. 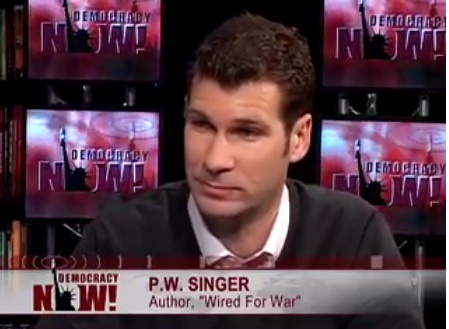 SINGER: Well, so, I spent the last several years going around trying to meet with everyone engaged in this robotics revolution, everything from the scientists behind it to the science fiction authors influencing them, to the drone pilots, to the four-star generals, but also went out and interviewed people in the region. And this question of messaging, one of the people that I met with was a senior Bush administration official, and he said, “The unmanning of war plays to our strength. The thing that scares people is our technology.” But that’s very different when you go meet with someone, for example, in Lebanon. One of the people that I met with for the book was an editor of a leading newspaper there. And he had to say that basically this shows that you are cowardly, that you are not man enough to come fight us. So a disconnect between message we think we’re sending versus message that’s being received. For two weeks, the U.S. struggle to hold on to its last air base in Central Asia has made headlines, and the vote in Kyrgyzstan's parliament yesterday to close Manas Air Base will spark still more coverage. Analysts have rushed to portray this as a new chess match between a resurgent Russian Federation and a recalibrating United States; just as a new American president seeks to bolster the U.S. presence in Afghanistan, the principal land corridor from Pakistan is severed through a bridge bombing and the likely air base closure threatens the Obama administration's plan. The oversimplified but oft-repeated explanation is that Kremlin pressure is the source of Washington's predicament. Having served as Kyrgyzstan's ambassador to the United States from 1996 to 2005, I know a great deal about the establishment of the base and the struggle to keep it open. It's true that our friends in Moscow were never happy that the base was opened and that they have exerted pressure to close it. But a nation's decision to offer a friend territory for military purposes involves a number of complex considerations. A base agreement rests on the shared interests of the host and the country that sends troops or supplies through it. When the base was opened in 2001, my nation was moved by several factors: Kyrgyz were deeply touched and saddened by the events of Sept. 11, and we were intent on showing support for our American friends. Moreover, we shared a common foe and a common pain: Fifty of our uniformed servicemen had been killed from 1999 to 2001 in gun battles with the Islamic Movement of Uzbekistan, an organization that formally allied itself with al-Qaeda and that operated out of bases in Afghanistan it maintained with al-Qaeda and Taliban support. The U.S. commitment to end those operations corresponded with the national security interests of my country. Kyrgyzstan also hoped to benefit economically from the base, a wish that was never hidden. Every relationship has its peaks and valleys. But one thing has consistently troubled me about the relationship between the United States and my country. Once the base was set up, I saw a fairly radical change in American attitudes. Before, Washington had consistently juggled a series of priorities -- broadly speaking, they were security concerns, economic concerns, and advocacy of human rights and democracy. But once the base was established, it became clear that while other concerns might be voiced from time to time, only one thing really mattered: the air base. In the end, this shift served neither country's interests. In the race to report the worst economic contraction among rich countries this year, Britain is being run close by another island nation: Japan, the world's second biggest economy. Japan is, however, winning the contest for the country with the most shambolic politics - this week its finance minister, Shoichi Nakagawa, resigned after turning up drunk to a press conference after the G7 summit in Rome last weekend. Nevertheless, Japan stands a good chance of being one of the few countries to benefit from the economic crisis. Many Japanese would find that hard to believe. Unemployment is rising sharply; the big, famous Japanese names such as Toyota, Panasonic and Sony are all making losses; exports are plummeting; and manufacturing output has dropped to a level last seen in 1983. Any Briton who thinks the reason our economy is weak is that we no longer have much manufacturing should come to Japan, for the reason Japan is weak is that it has too much (20% of GDP, compared with 10% in Britain), making precisely the things that everyone has just stopped buying, such as cars and fancy televisions. So where is the silver lining to all those clouds? It lies in politics, and the sharp kick in the pants that the economic crisis is about to give to the old political elite. A general election must be held by October at the latest, and could be forced much sooner. The same outfit - the Liberal Democratic party, which is actually a conservative group - has run the country for the whole of the past half century, barring nine months in 1993. The LDP survived even the country's stagnation during the 1990s, when Japan's financial crash destroyed its banking system. But, finally, the LDP is running out of road as fast as it long ago ran out of ideas. The prime minister, Taro Aso, has an approval rating that would shame even George Bush. As a result, the main opposition, the Democratic party of Japan, a centre-left group, is miles ahead in the opinion polls. Its leaders are plotting what they will do when they win power in a manner reminiscent of Labour in 1997, though with a touch of 1979 Thatcher too. The party's secretary-general, Yukio Hatoyama, says that as soon as it wins, the DPJ will outline its policies and fire any bureaucrat who won't support them. I keep asking the question, "Why are we in Afghanistan?" No one has a good answer. A few without television respond, "To get Osama." But everyone agrees that he is somewhere in Pakistan. Then the answer is: "As President George W. Bush said, 'to spread democracy.'" The Brits tried to spread democracy for years. The Russians tried to spread communism for years. But democracy must come from within. I helped liberate Morocco, Algeria, Tunisia, sixty-eight years ago and they have yet to opt for democracy. We liberated Kuwait eighteen years ago and they have yet to opt for democracy. In the Muslim world more important than freedom and democracy is tribe and religion. We have made the good college try for over seven years and now should realize that we are not going to teach warlords to like democracy and grow cotton instead of poppies. Many Americans believe that Barack Obama and the Democratic majority in Congress will lower defense spending and restrain the militaristic foreign policy it underwrites. The coming years should destroy that myth. America's overly aggressive and fiscally reckless defense policy will survive the Democratic majority. The Obama administration inherits runaway defense spending and leadership of a military that wants more. Non-war or base defense spending will be more than $515 billion in fiscal year 2009. Adjusting for inflation, that's 40 percent higher than the defense budget when George W. Bush took office. Add the wars, nuclear weapons research, veterans, and homeland security, and you get about $750 billion. That is more than six times what China spends, 10 times what Russia spends and 70 times what Iran, North Korea and Syria spend combined. This explosion in spending comes despite a historically benign threat environment. Invasion and civil war, which traditionally justified militaries, are unthinkable here. North Korea and Iran trouble their citizens and neighbors, but with decaying economies, shoddy militaries, and aversion to suicidal behavior, they pose little threat to the United States. Russia and China are incapable of territorial expansion that should worry Americans, unless we put our troops on their frontiers. And unlike us, they are out of the revolution export business. Terrorism is chiefly an intelligence problem arising from a Muslim civil war. Our military has little to do with it. A military posture of restraint -- one focused on U.S. defense rather than quixotic efforts to promote social transformation and dampen all instability -- would allow us to spend half what we do on defense. We'd be safer for it, because lower spending would discourage us from meddling in others' conflicts. The Pentagon doesn't see things that way, of course. True, Obama's principle defense advisers, Joint Chiefs of Staff Chairman Adm. Michael Mullen and Secretary of Defense Robert Gates, have recently spoken about hard choices ahead. But they support budgets that avoid those choices. Both claim that the United States should devote a minimum of 4 percent of gross domestic product to defense, even in peacetime. Because GDP generally rises, this would ensure an annual increase in defense spending, liberating it from old-fashioned considerations like enemies. Base defense spending is about 3.3 percent of GDP. Getting to 4 percent would require a $94 billion a year increase. WINTER 2009 —More than just conventional wisdom, it has become almost a cliché to say that the wars in Afghanistan and Iraq have proved “how technology doesn’t have a big place in any doctrine of future war,” as one security analyst told me in 2007. The American military efforts in those countries (or so the thinking goes) have dispelled the understanding of technology-dominated warfare that was prevalent just a few years ago—the notion that modern armed conflict would be fundamentally changed in the age of computers and networks. It is true that Afghanistan and Iraq have done much to puncture that understanding of war. The vaunted theory, so beloved in the Rumsfeld-era Pentagon, of a “network-centric” revolution in military affairs can now be seen more clearly as a byproduct of the 1990s dotcom boom. The Internet has certainly affected how people shop, communicate, and date. Amid this ecstatic hype, it is not surprising that many security studies experts, both in and out of the defense establishment, latched onto the notion that linking up all our systems via electronic networks would “lift the fog of war,” allow war to be done on the cheap, and even allow the United States to “lock out” competition from the marketplace of war, much as they saw Microsoft doing to Apple at the time. Nor is it surprising that now analysts are writing off high-tech warfare altogether in the wake of Afghanistan and Iraq. Insurgents armed with crude conventional weapons have proven frequently able to flummox their well-equipped American foes. Many observers increasingly seem to believe that if irregular warfare is likely to be the future of armed conflict, advanced technologies have no great role. These “all or nothing” attitudes are each incorrect. High technology is not a silver bullet solution to insurgencies, but that doesn’t mean that technology doesn’t matter in these fights. In fact, far from proving the uselessness of advanced technology in modern warfare, Afghanistan and Iraq have for the first time proved the value of a technology that will truly revolutionize warfare—robotics. When U.S. forces went into Iraq, the original invasion had no robotic systems on the ground. By the end of 2004, there were 150 robots on the ground in Iraq; a year later there were 2,400; by the end of 2008, there were about 12,000 robots of nearly two dozen varieties operating on the ground in Iraq. As one retired Army officer put it, the “Army of the Grand Robotic” is taking shape. It isn’t just on the ground: military robots have been taking to the skies—and the seas and space, too. And the field is rapidly advancing. The robotic systems now rolling out in prototype stage are far more capable, intelligent, and autonomous than ones already in service in Iraq and Afghanistan. But even they are just the start. As one robotics executive put it at a demonstration of new military prototypes a couple of years ago, “The robots you are seeing here today I like to think of as the Model T. These are not what you are going to see when they are actually deployed in the field. We are seeing the very first stages of this technology.” And just as the Model T exploded on the scene—selling only 239 cars in its first year and over one million a decade later—the demand for robotic warriors is growing very rapidly. The truly revolutionary part, however, is not robots’ increasing numbers, or even their capabilities. It is the ripple effects that they will have in areas ranging from politics and war to business and ethics. For instance, the difficulties for the existing laws of war that this robotics revolution will provoke are barely beginning to be understood. Technology generally evolves much more quickly than the laws of war. During World War I, for example, all sorts of recent inventions, from airplanes dropping bombs to cannons shooting chemical weapons, were introduced before anyone agreed on the rules for their use—and, as to be expected, the warring sides sometimes took different interpretations on critical questions. While it is far too early to know with any certainty, we can at least start to establish the underlying frameworks as to how robots will reshape the practice and the ethics of warfare. Obama recognizes that Afghanistan and Pakistan represent two fronts in the same war. Just in case he had any doubts about the challenges ahead, U.S. envoy Richard C. Holbrooke was welcomed to South Asia last week with a bomb in the Pakistani border city of Peshawar and coordinated attacks in the Afghan capital of Kabul that left 26 dead. Afghanistan's intelligence chief said there may have been contacts between the assailants in Kabul and militants in Pakistan, underscoring that the neighboring countries represent two fronts in one war. The Obama administration has recognized this with Holbrooke's portfolio, which is now being called "Af-Pak." Holbrooke is there to review U.S. policy on Afghanistan and Pakistan; findings will be delivered to a NATO summit in April, when allies undoubtedly will be asked to contribute more troops and aid for the fumbled war effort. The full extent of that failure has become clearer with new assessments of Taliban gains in the last two years through guerrilla hit-and-run strikes, roadside bombs and suicide attacks. Director of National Intelligence Dennis C. Blair said last week that support for the Taliban has grown in response to the corruption and ineffectiveness of the U.S.-backed government of Afghan President Hamid Karzai. Where do we go from here? Defense Secretary Robert M. Gates has asked for an Iraq-style "surge" of about 30,000 troops in Afghanistan to beat back Taliban gains and step up training of the Afghan army and police. President Obama rightly asked him to define the mission and endgame before authorizing the full deployment. Exactly what are the military objectives? Are we there for years or decades? Are we trying to stabilize the country or build democracy? As with most wars, there is no purely military solution to this one. Army Gen. David H. Petraeus, the architect of the surge in Iraq, argues that troops must be accompanied by economic and reconstruction aid to help strengthen the central government. That would be true if the Afghan government were competent and the international community held it accountable for the aid it receives. A key trans-Pacific alliance needs freshening up. Here's how to do it. By MICHAEL J. GREEN | From today's Wall Street Journal Asia. As Secretary of State Hillary Clinton arrives in Tokyo this week, she seems to be finding just the right pitch on Japan. In her Senate confirmation hearings in January she embraced the United States-Japan alliance as the "cornerstone" of America's Asia strategy. She struck another chord when she said she would meet with the families of Japanese citizens abducted by North Korea, reportedly overruling careerists in the State Department who fretted about Pyongyang's possible response. These are positive steps, but the biggest challenge for Secretary Clinton will be navigating the unraveling political situation in Tokyo. Taro Aso is the third prime minister in as many years, and his rapidly waning support in the polls points to a likely victory by the opposition Democratic Party of Japan (DPJ) in elections later this year. However, the DPJ is deeply divided, and many analysts expect that government to also collapse in short order. It could take months, or even years, for stability to return. So it is important to launch an agenda now that builds on our shared interests and values and that will endure regardless of political developments in Japan. First, the U.S. and Japan should forge a new partnership on climate change. Second, the U.S. should be more willing to cooperate with Japan on defense and space programs. Third, the two countries should revitalize the subcabinet-level economic dialogue begun in 2001 to encourage Japan to take action on regulatory reform, disposal of nonperforming loans and deflation. Finally, the U.S. should pick up on one of Mr. Aso's better ideas: the promotion of an "arc of freedom and prosperity" across Asia. Secretary of State Hillary Clinton has chosen Asia as the destination for her first overseas trip. Starting this Sunday, she’ll be on a week-long trip to Japan, South Korea, China, and Indonesia. This has significance for several reasons. Asian economies have been dramatically expanding since the 1970s – no surprise there. But what is less widely recognized is their equally dramatic military expansion, which has transformed them from low-tech land forces to high-tech, civilian-military, air and sea post-industrial complexes. Asia is bristling with nationalism and weaponry, even as Europe drifts into functional pacifism (despite its contribution to NATO forces in Afghanistan). It is this joining of economic might with military might that makes Asia the strategic focal point of the new century. The Bush Administration understood this reality, but could not address it because it was preoccupied with Iraq and Afghanistan. The new Obama Administration is also preoccupied with Iraq and Afghanistan. But whereas former Secretary of State Condoleezza Rice was running all over the world on her own, the Obama White House has reorganized the top levels of the State Department so that certain issues, like the Greater Middle East, can be delegated to special envoys, allowing Clinton to give Asia the attention it deserves. The Bush strategy was to leverage Japan and India militarily and diplomatically against a rising China, even as it sought good relations with Beijing. President Obama will do the same – for there really is no other choice. The difference will be in the energy applied to the task. Half of life is showing up, as the cliché goes, and Secretary Clinton has signaled with her first trip that she plans to show up often in Asia. A measure of the new administration’s realization of the importance and nuances of Asia is demonstrated by Clinton’s decision to add Indonesia to the itinerary. Indonesia is crucial for many more reasons than the fact that President Obama went to school there for a few years as a child. It is the largest Muslim country in the world and the fourth most populous one. It commands the narrow Strait of Malacca, which is the world’s energy highway, where supertankers transport Middle Eastern oil to the burgeoning middle class fleshpots of the Pacific Rim. Thailand – Southeast Asia’s former political linchpin – is polarized and increasingly unstable, and Malaysia and Singapore are facing their own difficult political transitions, but Indonesia seems to be on its way to becoming an authentically stable Muslim democracy.